Virto SharePoint Tag Cloud is a simple and useful tool for effective data structuration and easy navigation in SharePoint lists. Virto SharePoint Tag Cloud is a simple solution for effective structuring data and easy navigation in SharePoint 2010 or 2007 lists. This Web Part extends list field sets with the additional “tag” field and allows users to add a tag cloud to SharePoint site pages. Virto SharePoint Tag Cloud web part offers powerful tools for structuration and effective usage of information based on the tag cloud principles. With Virto SharePoint Tag Cloud, you can quickly structure your SharePoint data and provide easy navigation according to any classification you define. It is a part of Virto SharePoint Collaboration Suite and Virto ONE License. Virto Tag Cloud is keeping a tag database in a SharePoint Tag List (Tag Data Source). Using Virto Tag Cloud, you can create and use unlimited number of Tag Lists (Data sources) and relate any SharePoint list to any data source. Data source can be applied to a site collection or current site only. 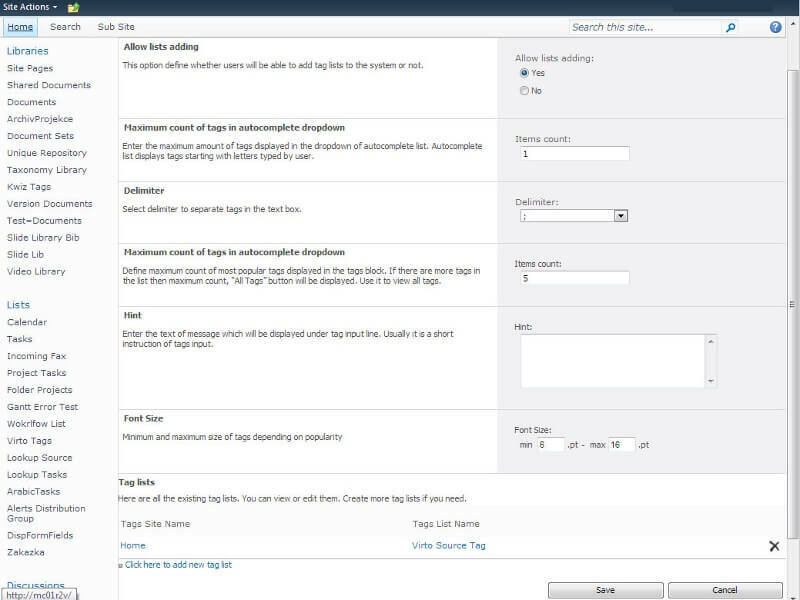 With Virto Tag Cloud web part, you can allow or disallow to add new tags. Also, you can define maximum count of most popular tags in tag blocks and set tag cloud font size parameters. Using Virto Tag Cloud, you can quickly structure your SharePoint data with tag auto completion and highlight. Virto Tag Cloud web part uses tag hints. You just have to enter a text of message which will be displayed under tag input line. Usually it is a short instruction of tags input. Also, there is available tag alphabetical or rank popularity sort order. Virto Tag Cloud is a simple and useful tool for effective data structuration and easy navigation in SharePoint lists. Tag cloud is an intuitive, simple and, thus, extremely popular way to structure information. Tag cloud has two main functions: navigation and popularity ranking. In fact, a tag is keyword assigned to a piece of information. It helps to describe an item and allows it to be found again by browsing or searching. Microsoft SharePoint 2010 is enhanced with tagging and tag cloud features, but you still miss them in SharePoint 2007. Using Virto Tag Cloud you can enjoy all the benefits of such data structuring when working with your SharePoint 2007 sites. Virto Tag Cloud web part is essentially a combination of two different but integrated web parts. The first one allows you to extend list field sets with additional “tag” field. 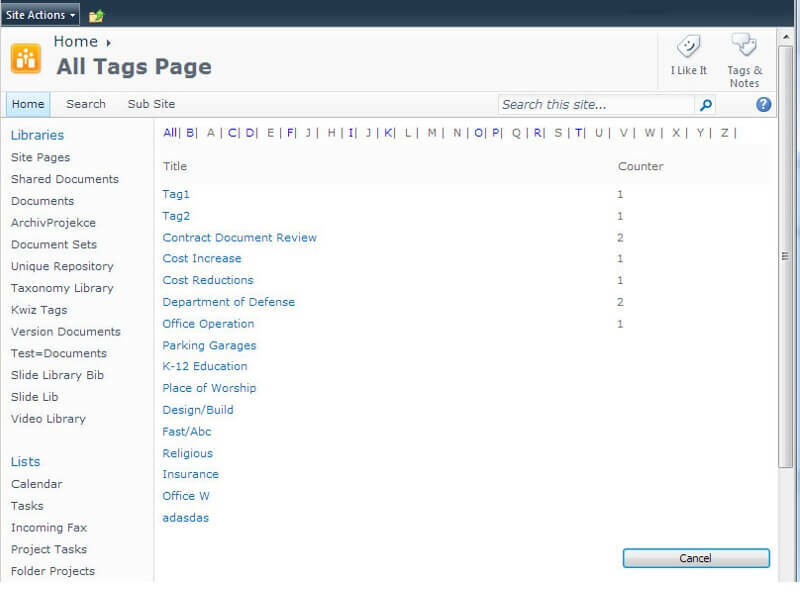 The second web part is designed to add a tag cloud to SharePoint site pages. Being combined in a single solution, these two web-parts provide users with powerful tools for structuring and effective usage of information based on the tag cloud principles. With Virto Tag Cloud, you can quickly structurize your SharePoint data and provide easy navigation according to any classification you define. 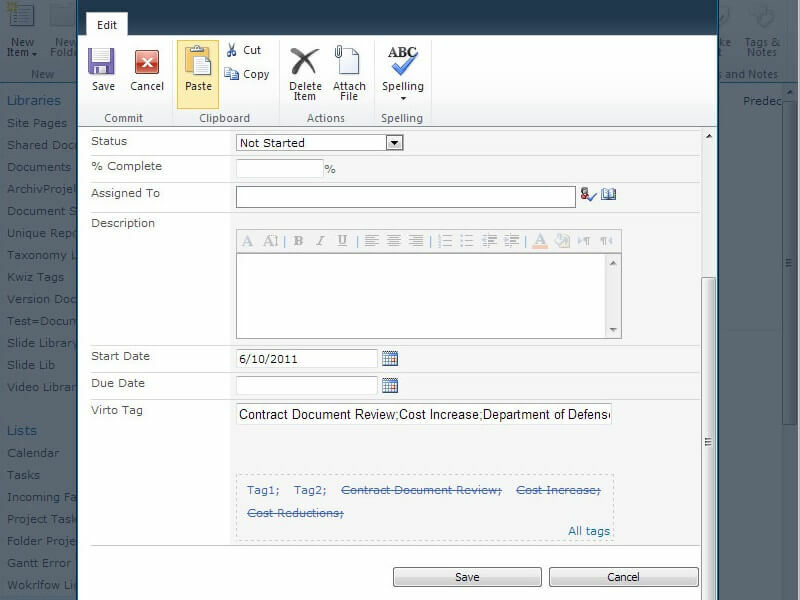 Tag management Using Virto Tag Cloud, you can allow or disallow user to add new tags. Tag hints Enter a text of message which will be displayed under a tag input line. Usually it is a short instruction of tags input. Good impressions. The product extends list field sets with additional “tag” field, customization was easy and robust.